When the flu bug hit the Big Apple, computer scientists used Twitter data to track it. It’s not the first time researchers have used Twitter to trace nationwide trends in influenza outbreaks by mining huge volumes of tweets with software that culls out irrelevant reports and analyzes those that matter. But this time a team from Johns Hopkins University and the George Washington University used specialized software to drill deeper, probing flu-related tweets from a single bustling metropolis: New York. The finding, based on data from the 2012-2013 US flu season, was published by the journal PLOS ONE. The results show that Twitter data can accurately gauge the spread of flu at the local level, too. For example, when flu cases are on the rise, hospital administrators must make sure they have enough beds, staff, and medicine to cope. Also, an early alert can lead local health officials to boost efforts to vaccinate healthy residents to help contain the virus. The team used software developed in Dredze’s lab to scan through hundreds of millions of tweets. Many Twitter users mention where they live or use a GPS-equipped cell phone to tweet. That allows the researchers to focus on posts from particular geographic areas. The team’s software is also designed to distinguish between a tweet from someone who likely is ill with flu, as opposed someone who is merely talking about the disease or worried about catching it. “Not only did our results track trends on the national level, but they also did so on the local level,” says David Broniatowski, the paper’s lead author and former postdoctoral fellow at Johns Hopkins who is now an assistant professor at George Washington. “It gives our system validity. 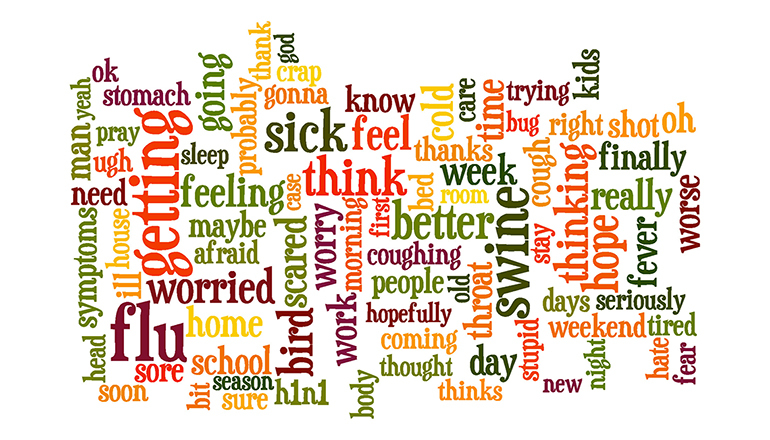 The researchers isolated flu patient tweets from Sept. 30, 2012, through May 31, 2013, from the five boroughs of New York City and some adjoining communities; they compared their results with compilations of flu cases by the New York City Department of Health and Mental Hygiene. Although Dredze’s team collected its own Twitter data for this project, Twitter’s recently announced Data Grants program will give scholars access to its public and historical data for use in gleaning helpful information on various topics. Broniatowski suggests that the techniques used to track flu trends via Twitter data might also be applied to the study of subjects such as crime, political developments, and response to natural disasters. The National Institutes of Health and National Science Foundation funded the flu trend research. Publication was funded in part by the Open Access Promotion Fund of the Johns Hopkins University Libraries.